This incredible set-up was designed by Jerry and Sylvia Hathaway, with all three pieces featuring the Citroën hydropneumatic suspension, including the custom trailer! 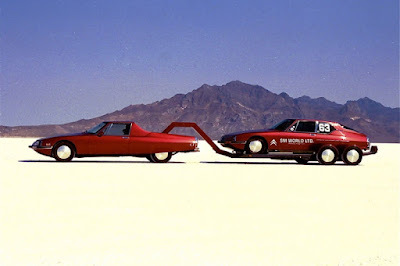 Both Jerry and his wife, Sylvia, have set records at over 200 MPH at the Bonneville Salt Flats in 1985 and 1987, respectively, in their custom SM racecar, making them the third couple to become lifetime members of the Bonneville 200 MPH Club in their specially prepared twin-turbo charged Citroën SM. We are thrilled to have the Hathaway Race, Port and Work SMs on loan for the Citroën exhibit. They are definitely worth the look! Reservations required. For information or to make reservations please call (805) 385-5400. It takes a lot to set a land speed record at Bonneville salt flats and a lot of people have tried with a variety of different machines. But the fact that Jerry and Sylvia Hathaway have set the record in a Citroën SM - a front-wheel-drive V6-powered French luxury sedan - says a lot about them. 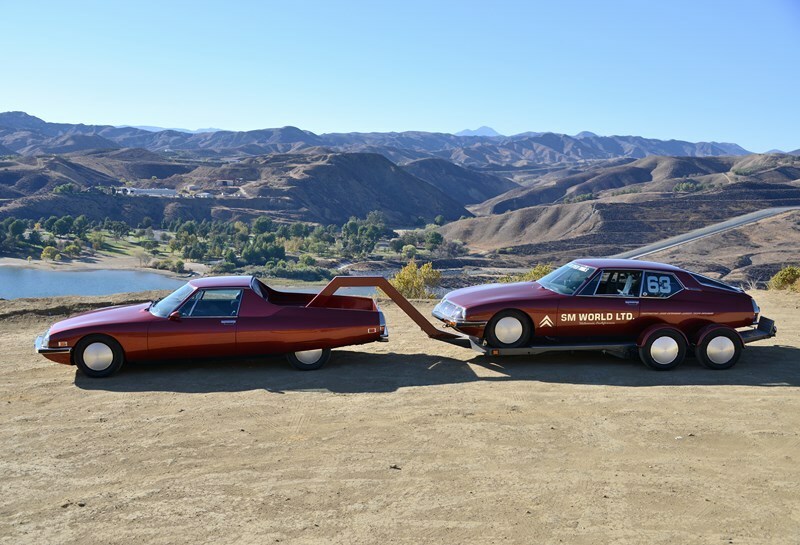 But this isn’t the only unusual Citroën SM experience the Southern California couple have had. It’s not enough that they took the performance-enhanced SM to Bonneville - they hauled their specially-prepared Citroën with another Citroën SM that had been converted to a fifth wheel and, oh, the race car was sitting on a trailer that featured Citroën’s unique gas/hydraulic suspension system and was custom made for the race car. Let’s start with the fact that Jerry Hathaway has been working on Citroëns since 1972 when he worked as an alignment tech at Irv White Buick in Southern California. He could do alignments on Buick with lighting speed partially because, as he describes the job, it was routine and monotonous and he had been doing it since 1965. So when Irv White added Citroëns to the product line the rest of the mechanics in the shop ran for cover but Jerry found a new passion. Jerry moved to another dealership who, in 1976, decided to also add Lancia to the mix. Unfortunately the service department at that dealership wasn’t big enough to handle both Citroën and Lancia according to the latter company so they planned to drop the Citroën line, Jerry’s passion. Jerry called Citroën who said he could buy the franchise if he wanted and the dealership agreed to sell the franchise to him for basically the cost of parts and tools. This was the start of something big as Jerry, an admitted pack rat for Citroën parts, jumped on the opportunity and opened his own shop, Citroën SM World, that was factory-certified by Citroën. Over the years Jerry has developed his contacts within the Citroën community to the point where he can buy parts directly from the factory and has great sources all over the world. And if you’re going to restore a Citroën SM, he’s the man to see. Period. So how did a passion for the Citroën SM turn into a world speed record? One of Hathaway’s customers was hot-rodder and ex-Bonneville dry lake racer John McKibben, who kept talking about what a great shape the SM had for a Bonneville Land Speed Record car. The words sunk into Jerry, who had always wanted to be a drag racer but never had the time to pursue it. He had an SM at his shop that looked like it had been rear-ended by a freight train. It had been purchased originally to be cannibalized for its parts. Instead, it ended up being totally rebuilt as a race car. At first the car was equipped with three 48 mm Weber carburetors and the usual hot-rod cams and pistons an produces an estimated 250 horsepower from its 183 cubic inches to pull the 3,127 pound front-wheel-drive Citroën to a speed nearly 154 mph at Bonneville’s 4.400-foot elevation. Yep. Front wheel drive. Oh, and the 3.0 liter V6 is a Maserati engine. There are some people who would eschew French or Italian cars and this is both, essentially. But 154 wasn’t enough and the team continued to refine the car over the years, ultimately adding an AiResearch turbo to the mix that kicked the car over the 200 mph mark. Specifically, 200.002 in 1985. From this place Jerry’s wife, Sylvia, took the wheel in 1987 and set the land speed record at 202.301 miles per hour. It used to be that the car was pulled by a pickup and trailer but, someone else decided they wanted this rig more than the Hathaways and liberated it from in front of the shop. When the team were creating the race car they had already moved a lot of the Citroën’s unique suspension components to the rear of the car so this gave Jerry an idea. The Citroën suspension is completely unique in that there are no traditional springs whatsoever. Instead, there are steel spheres with two chambers, one of which is pressurized to 600psi with nitrogen, which is a gas. A gas can be compressed which acts as the dampening agent. Hydraulic fluid is on the other side of the diaphragm which goes out to the wheels/suspension parts. There is an entire Wikipedia page dedicated to this suspension design. While not everybody is going to be as clever and resourceful as Jerry and Sylvia are with these cars, there is a growing interest in the Citroën SM. The very advanced technology in the car combined with incredible ride comfort, uniqueness and a great driving experience make these increasingly desirable collectors cars. While they do have the reputation of being unreliable it’s more that they are specific about how certain things are maintained including using the correct parts and specific oils. Those who follow the repair guidelines for these cars are rewarded with a reliable, exceptional and wonderful machine that would stand out at any car show. 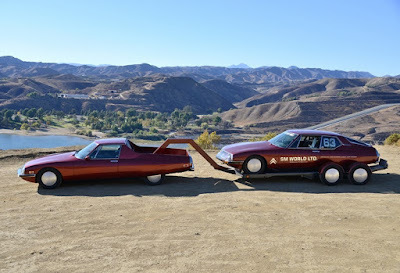 And if the SM isn’t unique enough already, you can build a speed record race car and a unique pickup truck and a trailer with a dual air suspension. Or just go see Jerry and Sylvia and have them take a gander at your SM or help you find one. In what may seem an uncomfortable transition from Chip Ganassi Racing, Tony Kanaan (TK) finds a home where the owner has spent more time winning as a driver than a team owner but has a history at Indianapolis Motor Speedway (IMS) that is undeniable. At 42 years old, TK still has the thirst to make more history in the most dynamically competitive open-wheel racing series found in professional driving. 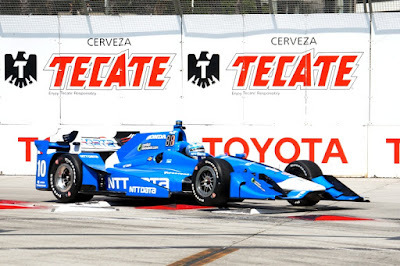 With one IndyCar Series championship in 2004 (Andretti Autosport Honda Dallara) and one INDY500 win (KV Racing Technology Chevy Dallara) Tony felt driving for a team where he was always behind the leading driver of Scott Dixon wasn't where he was going to receive his best chance at closing out a career on top. 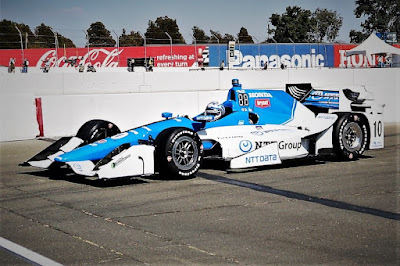 Since joining Ganassi Racing in 2014, TK was still on a team supplied with Chevy-power ... that is until last year where Chip had his cars become Honda-powered and this did not place Tony where he was use to being at the end of a season - P10 after averaging between P5 and P6 during fifteen previous years. At AJ Foyt Racing managed by Larry Foyt, he will be the lead driver in the No. 14 (AJ Foyt's famous number) Chevrolet-powered Dallara with an engineer, Eric Cowdin - who was there when TK won the INDY500 with Chevy-power, TK's 2004 IndyCar title, and 15 of his 17 victories overall - he is very comfortable with while driving a new chassis that has less downforce and becomes more driver dependent. MODERATOR: Welcome, everyone, to today's IndyCar media conference call. 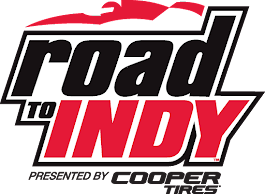 Earlier today, AJ Foyt Racing announced that Tony Kanaan, the 2004 Verizon IndyCar Series champion and 2013 Indianapolis 500 winner, will be the driver of its No. 14 ABC Supply Chevrolet IndyCar in 2018. We're happy to be joined this afternoon by the team owner of AJ Foyt Racing, racing legend AJ Foyt; the team's president and AJ's son, Larry Foyt; and the driver of the No. 14 car, Tony Kanaan. AJ, we'll start with you: Your team has competed against Tony Kanaan in IndyCars for at least the last 15 years. What made him the pick for the No. 14 car for 2018? A.J. FOYT: Well, obviously, you know, I've always had the 14. I think Tony can put it up there where the 14 is used to running, that's first, so I think he can do that -- I don't say easy, but I know he can do it. MODERATOR: Larry, in the press conference you had earlier today, you said that you've had discussions with Tony in the past about coming over to the team. How did it finally all come about for 2018? LARRY FOYT: Well, I think it just -- both of us were at a position where we could make it happen, and so that's really what it came down to. We both knew each other and had talked and had said if the time ever came available that we could do something together that we would look at it seriously. So that's really what happened, and I think everybody was just ready for a new challenge, and that's what it was. We know it's going to be a challenge, but we felt like together we could really put something together and start winning again, so that's what brought it together. MODERATOR: Tony, joining a legendary name like Foyt, getting back with your friends at Team Chevy, which you took to the Indy 500 win, how excited are you for the 2018 season? TONY KANAAN: Very excited. Obviously we know we have a lot of work to do to build the team to where we want it to be. 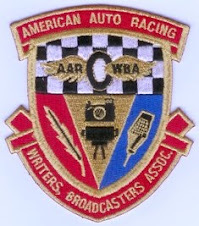 I mean, I'm coming off of a very difficult season, so I think it was a time for us to get together here with -- I'm bringing my engineer, Eric Cowdin, which was part of the win with the 500 Chevy, and we're excited. It's a great time for me. I think driving for a legend like AJ and all the stories and what I can learn from him still, it will be something that I'm going to take it for the rest of my life. So I'm really excited about it. Hopefully we'll put that 14 car where AJ wants me to put it, which is going to be in first place. MODERATOR: You mentioned the 14 car, and AJ wanting it to be in first place. You've driven the No. 11 was associated with you, you've driven a famous No. 10. What about driving the No. 14? Is there any extra pressure just because it's the 14 and you drive for Foyt? TONY KANAAN: Big time. I mean, I think out of all the numbers that I've driven through my career, that is definitely the one that puts a lot more pressure on me, so I'm going to have to make sure that I keep up the tradition of that number and hopefully we will do that. But we'll definitely -- I was thinking about that the other day. 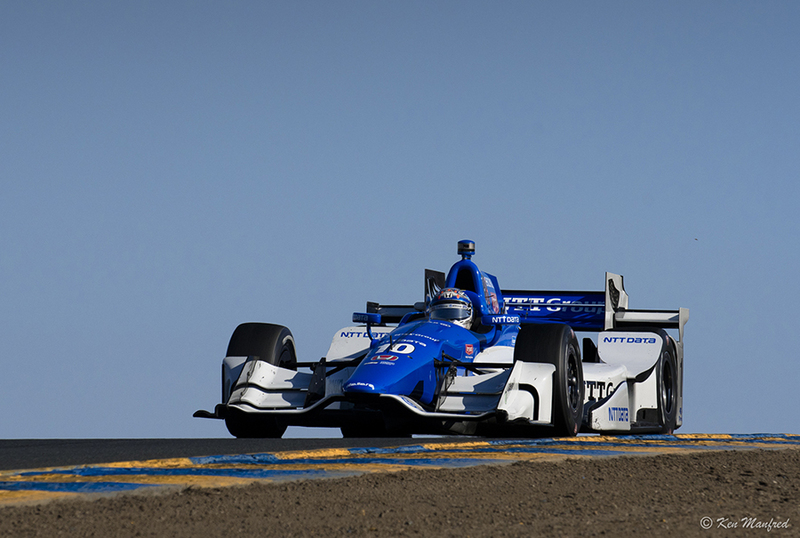 I mean, I can't wait for opening day at the 500 and put the 14 car to do a lap like that, especially me driving. Having garage 1 for me, it's like -- it's kind of cool. It's one of those things that I've always looked around and said, AJ can do this here, AJ can do that. He basically owns the Speedway, so hopefully we'll be able to keep the 14 where it belongs. Q. Motorsports Journal - This is kind of an exciting change. How do you feel the team will respond to your style of driving and what you brought to the series all these past 15, 20 years? TONY KANAAN: Well, I think the cars are changing, so how the team is going to respond to that is basically what we're going to build. Bringing my engineer in, I think it's a big help because he knows the way I like to drive. He knows the way I like to set up the car. So I would say for me, it's a big step. We can come in and try to introduce my driving style. Obviously we don't know how the new car is going to perform. We've still got to go test and see how is it going to behave, so everyone is pretty much starting from scratch. Q. Motorsports Journal - We also heard recently that your great friend Helio Castroneves won't be on the circuit full-time, just Indy 500. How is that going to feel without Helio in the field? 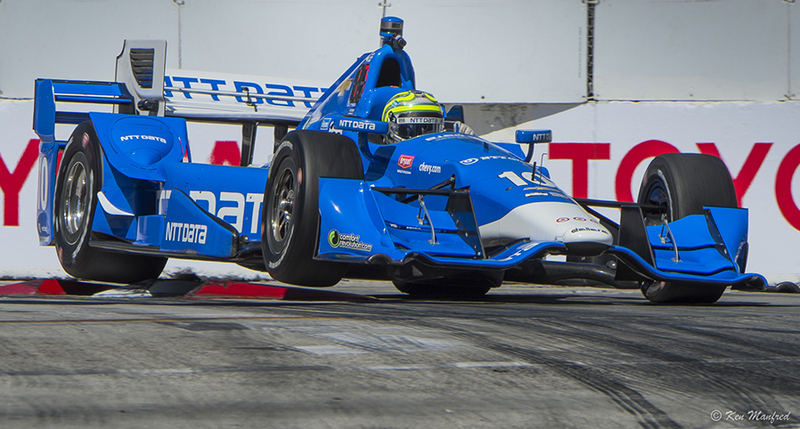 TONY KANAAN: Well, he's definitely going to be missed. I think he was a big name in IndyCar, like I am. We started together back in '98, so obviously he chose to pursue another career as far as racing, go to another series, so I wish him the best, and obviously I think, like I said, he will be missed. Q. It's been a long time since we haven't seen you in Victory Lane, and we also have noticed that Team Foyt hasn't been too successful. How are you planning to bring victories to another team with new aero kit, new teammates and everything? TONY KANAAN: Well, I think that's why we got together. We both needed a change. We both needed some boosts to put this team in Victory Lane, and we're doing everything we can. We have just a great sponsor backing us with ABC that's been with the team for 14 years, and they're giving us every tool that they can to be able to make it happen. I think with the new car, like everybody starting from scratch, I think that's our chance. It's our chance to get ahead of the game with all the resources that we have and the people that we have working for us, and to put it back there. We both need it to go back to Victory Lane, and that's why there's a reason that we actually came together with this partnership to be able to do it. Q. You were talking about Helio a little bit earlier, and it's kind of a different-looking IndyCar Series now. You're basically kind of the last man standing from the old CART era, you and Helio were. Is there any point where it kind of makes you look back and go, wow? It's an interesting feeling, I guess, in a way, being really the longest tenured guy in the IndyCar Series nowadays. TONY KANAAN: Yeah, I guess the only good people are the only ones that last, and I guess I'm the last man standing, so I'm pretty proud of my career. Of course if I would go back 20 years ago and would have said that I was going to be here for this long, I don't think I could predict that, but obviously year in, year out, people keep saying, the old guys here and there, but we keep delivering, so I think it doesn't matter what age you are. If you're winning races, I don't think people care. All we care is about winning. I still think I can win, and I'm glad that I'm still around so we can keep the tradition of the old timers, that we can still do it. We'll be here to represent. Q. I am curious, I know you've done some time away from IndyCar with the Ford GT program and done some time in sports cars; is that something that you would consider maybe on a more regular basis after your time in IndyCar is done, kind of like what Helio is doing? 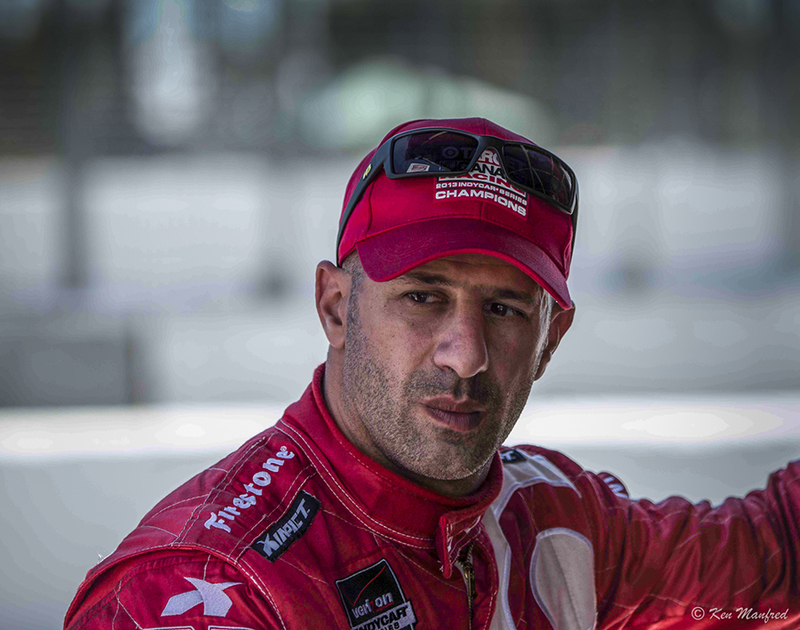 TONY KANAAN: Yeah, I think I would say -- obviously we just signed a multiyear deal here, so I'm not really thinking about it, but obviously there is no secret that I would love to do the endurance races. AJ won all of them, so I've got to catch up with him. 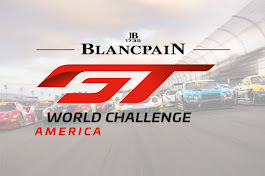 I have Daytona, but I don't have -- I have the 24 hours but I don't have a Le Mans, so I've got to try to do that. If it doesn't conflict with our program in IndyCar and it doesn't hurt the program, I would love to do it, and in the future obviously that would be something that I'm interested, but right now, it's definitely not going to be something that is going to be going through my head to do full-time. Q. Larry, I hear the enthusiasm from listening to Tony; what kind of different dynamic do you feel like he's going to bring to the team, maybe a different sort of energy from what you guys have had in the past? LARRY FOYT: Well, obviously he's got a lot of experiences, which is going to really pay with this new aero kit and figuring that out quickly, but the one thing I think Tony and I when we started talking about this, we looked at each other, and it's a lot of trust between each other. I had to know Tony is not just trying to ride out his last years, that he's going to give 110 percent, and wants to know that we're going to put all our resources into the race team to give him a chance to win, and that's exactly the trust that we had to -- I think when we looked each other in the eye, we both knew that this was what we wanted to do and our goals were aligned, and that's why we think it's going to work. Q. Larry, if you could talk a little bit, obviously this is great news today, but you'll be looking to fill a second car; what are you looking to help build around Tony, what kind of driver to build a team around Tony? LARRY FOYT: Yeah, that's -- really with the second car, we haven't made any decisions yet. We're going through everything internally and trying to figure out what direction to go there. But this is -- we've really been focused on getting this deal done with Tony and some of the big engineering pieces here in the team put together, and from there we're just having internal discussions and probably won't be too long, we'll try to come to a decision with that. Don't really have an answer on where that's headed just yet. Q. How important was Tony's great oval success in his career to being part of this decision? LARRY FOYT: You know, yeah, of course it's wonderful to have an Indy 500 champion on your team and someone who came close to winning a couple oval races this year. I think he leads every one of them. Obviously that's a big part, especially from our history, and the importance we hold to Indianapolis and the 500. But you know, we want Tony because he can and wins everywhere, so that's the most important thing, and I think for us, just his experience of being on some bigger teams and what he can bring and just help -- and obviously his enthusiasm is infectious in getting all of us motivated, and I think he's going to be great with our sponsor, with ABC Supply. They do this for their people and bring hundreds of people to every event, and I think that's something Tony is going to be great with, as well, so it's just a great package all the way around. Q. You're switching from Honda to Chevy; how are you taking that difference, and how do you plan to adapt to the new car? TONY KANAAN: Yeah, I mean, it's hard to tell. Obviously when I won the 500 in 2013, it was with Chevy, then we switched engines. You know, I think Chevy has over the past years caught up to the Hondas, especially at the Speedway, so we strongly believe that we're going to be extremely competitive. Of course I have some feedback probably to add and try to help them out with some of my experience. The plan will be just to really -- I've got to drive the car to be able to tell you something more, but right now I think we have a pretty good package. Q. Motorsports Journal - With this new package that's coming out, from what little we're able to learn from statements that people make, that it's going to be a little freer, a little bit looser, I was wondering what have you heard from the people who have test drove this? 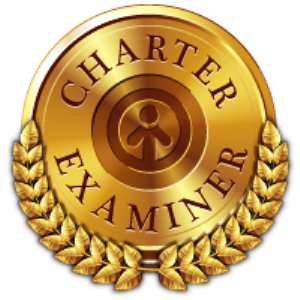 Did you get any insights, any direct conversations that you had? TONY KANAAN: No, I heard the same things you've heard, that the car has a lot less downforce, it's a little bit more sketchy and difficult to drive, which I think that's a good thing. It's going to make more difficult to the drivers. It's going to make a lot more challenging for the engineers. I heard the same things, that it's definitely a huge amount of downforce taken out of the car, and it's going to be a little bit more difficult to drive. Q. Motorsports Journal - What's your reaction to that? Is it like getting back into cart? TONY KANAAN: We like it. You should be able to drive the car. You cannot just -- engineers should be able to help you but they shouldn't dictate who's qualifying or winning races. Anytime you have to drive the car more, I'd be all for it. In what may be Tony's final chapter at the top rung of the Verizon IndyCar Series, AJ, Larry, Eric and TK believe they all have their best shot in 2018 to strike at another INDY500 win, and with consistency, deliver another Verizon IndyCar Series championship back to Brazil (a trophy Tony's great friend and fellow Brazilian, Helio, has never been able to bring back home).